We’ve come a long way since the days of big desks, stuffy boardrooms and private offices, but is your workplace ready to take the next giant leap into the future? 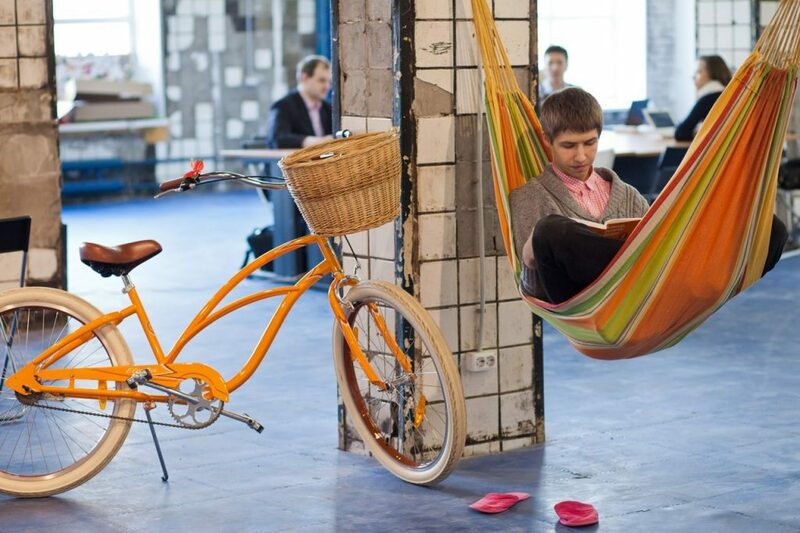 What will the workplace of the future look and feel like to work in? From sleep pods and slides to 3D printing and virtual reality, we take a look at what a day at the office could soon look like. It looks like the days of open plan offices with long rows of desks are well and truly numbered. But while bold colours, exercise balls instead of chairs and funky background music might inspire some, for others it’s the kiss of death for productivity. That’s why many companies are now opting for a mixture of interactive spaces and sound-proof pods, high-spec tech and retro blackboards. So your first task of the morning will be to pick the perfect spot to set up for the day. Don’t be surprised if you find yourself short of storage in the workplace of the future. In their latest attempt at creating a paper-free office, Deloitte in Montreal now give employees just one drawer, so piles of paper and reams of notes are simply not an option. It seems they like travelling light though, as feedback after six months is still positive. 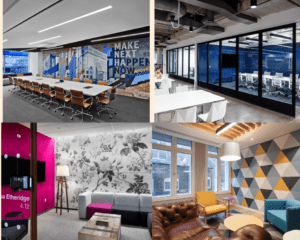 Once you’re settled in your pod or poised at your blackboard, you might find yourself surrounded by a few unfamiliar faces, as more and more companies opt for co-working spaces. Not only will you be able to mix and mingle with your own colleagues, you’ll also be able to draw inspiration from experts in a whole range of other fields. Come lunchtime, there’ll be no eating al desko in the workplace of the future or perching awkwardly in a shared kitchen. A recent study has found that those who work in an office with natural light and live plants report a 15 per cent higher level of wellbeing, are 6 per cent more productive and 15 per cent more creative. That’s why companies like HOK London are leading the way in what’s known as biophilic design, with grass, flowerbeds and deckchairs laid out in a light, airy, picnic-perfect atrium. Of course ‘late’ will be a thing of the past anyway. After a study by Oxford University revealed that the standard nine-to-five day can play havoc with human biology, many employers are now offering variable hours. And for those with little ones, sleep pods and on-site crèches are helping take the strain. With colleagues like Amelia, you may find you’ve more time on your hands in any case. Created by artificial intelligence developer IPsoft, Amelia is a virtual assistant who speaks 20 languages and can interpret the user’s emotions via a webcam. She might one day even be able to pass on your feedback about the office environment. The Bank of America is already using sensory data to understand office dynamics, and has proven that call centre performance improves when employees spend time socialising in their lunch breaks. Of course the virtual world goes beyond assistants, and with headsets getting smaller and sleeker, Virtual Reality is at last making strides into the mainstream. The opportunities are endless for anyone involved in design, and engineering firm Atkins is already using VR to guide clients around detailed virtual models. How these will be integrated into the workplace of the future remains to be seen but one thing seems sure, and that is, that will be present. Missed out on the mug rush for the 3 o’clock tea break? No problem. With a third of UK employees believing their office should have 3D printers by 2020, you’ll soon be able to create a new one in an instant. And it seems the applications of 3D printing are limitless, from architect’s models to simple bike spares for a quick fix before the ride home. You’ll need to be careful not to clutter up the office with 3D print-outs though. Instead of fibres and cables, you can now connect using visible light, with theoretical download speeds of up to 224,000Mbps. The downside? Since light can’t pass through solid objects, anything that gets in the way will cut you off. When it’s time to call it a day, will you opt for the fireman’s pole or the helter-skelter to get to the in-house tiki bar and ping pong tables? Sound mad? A recent report by Red Letter Days for Business showed that there’s method in it. Half of employees they spoke to felt neutral or negative towards their job while only 14 per cent “loved every minute” of work. The hope is that by injecting a bit of fun back into the workplace we’ll all learn to love our offices again. We say it’s certainly worth a try.